A new big band called “Some Like it Hot” is looking for trombonists. Rehearsals are on the fourth Wednesday of each month in Herstmonceux. If you can help, please contact Jo Wood for further details, jowood01@gmail.com, 07545 305690. The Mark Travers Project, created in 2017, is a twelve piece small big band, formed to experiment with colours outside of the normal big band repertoire. This has included Syncopated Psalms, a jazz choral piece for children’s voices, and, currently, an exploration and interpretation of the music of Thelonious Monk. All of the arrangements are original by Mark and exclusive to this band. The performance includes a scripted narrative, with actors, to add the story of the music to the event making it a unique musical experience. The band is Sussex based, but they are willing to travel. To find out more, or to book them, contact Mark at marktravers1@hotmail.com or Hannah Scott on 07910 099392. I went to see them in May, apprehensive about the multimedia aspect. Although, to some extent, it had a feel of work in progress, I enjoyed it. Not only that, but so did my better half, who is definitely not a jazz enthusiast. She thought the narrative gave context to the music. Although not to everyone’s taste, I thought that the various styles from ragtime to reggae, showing wit and invention, added to my appreciation of Monk. Especially Straight No Chaser, in which Stravinsky might almost have had a hand. To my mind, a sign of the genius of the originals: that they not only withstand, but flourish, under such treatment. The band, involving some of the best of Sussex jazz musicians, clearly enjoyed playing the music. At only £1 the printed programme was a bargain, informative and to the point. If you would like to see and hear The Mark Travers Project for yourself, you can go along to The Brunswick on the evening of Sunday 23rd. Then you can form your own opinion. Details are in the listings below. “It’s been two years since my dear dad passed away. Last year, we had a hugely successful ‘Les Fest’ memorial event celebrating his life. His big band and many other musicians joined us in the garden for music, chat and, of course, drinks. With DJ Clive spinning classic Blue Note tunes in between. “His legendary big band is now in its fourth decade and continues to flourish. I hope that Les would have approved of some of the new ventures. We are playing additional gigs besides the regular last Friday of the month jazz nights at the Patcham Community Centre. We have also invested in new lighting and charts, and professionally produced YouTube videos. “I enjoyed wonderful musical adventures with Dad and appreciate his insistence that I learned an instrument as a child. This kept us closer than might otherwise have happened. I hope my children learn an instrument so that the baton can be passed on to the next generation. “In recent years, the Sussex jazz scene has lost some remarkable people, but it’s fantastic to see it still attracting new interest from players and audiences alike. I’m proud that Dad contributed towards the legacy of this in some small way and feel privileged to now lead his band. “Of course all our family miss Les. His void cannot be filled and I truthfully think about him every day and especially when playing, often thinking “oh I must tell Dad about that when I next see him”, only to then realise, sadly, I can’t. 10:00 am – 12:00 pm, The Wacky Band at St Michael’s Hospice Summer Fair, 25 Upper Maze Hill, St Leonards-on-Sea, East Sussex TN38 0LB (01424 445177).Nominal entry fee. 2:00 – 4:00 pm, The Fabulous Honeys Swing Band at the Pavilion Gardens, New Road Brighton BN1 1UG (01273 730712), weather permitting. Free entry. 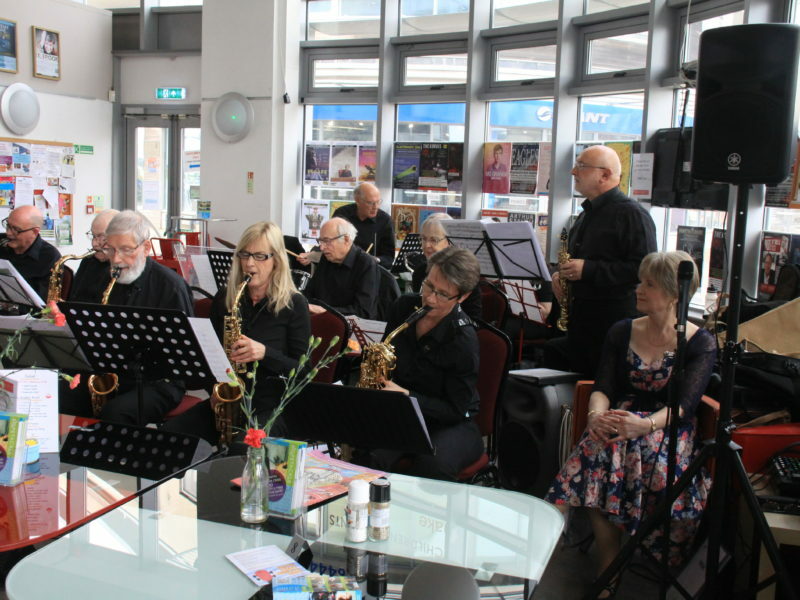 7:30 – 10:30 pm, Big Band @Brunswick: Big Band Sounds at The Brunswick, 3, Holland Road, Hove BN3 1JF (01273 733984). Free entry with collection. [R] 8:00 – 10:30 pm, The Rox Sessions Live at ‘The Hoff’: Bognor Regis Big Band open rehearsal at the Hothampton Arms, London Road, Bognor Regis, West Sussex PO21 1PR (01243 821434). Free entry with collection for the Rox music charity. 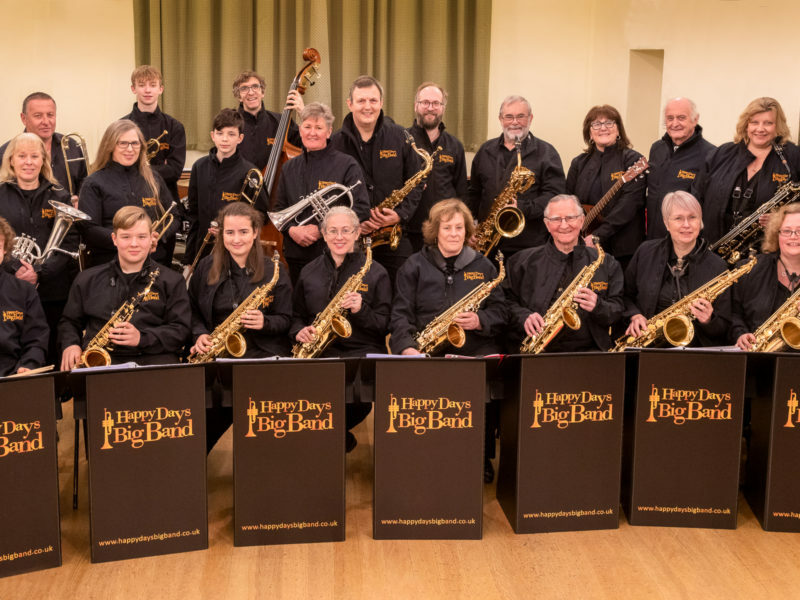 [R] 8:30 pm, The Fred Woods Big Band at the Horsham Sports Club, Cricketfield Road, Horsham, West Sussex RH12 1TE (01403 254628). £2 (Club members free). 3:00 pm, Len Phillips Big Band with star guests at Devonshire Park Theatre, 8, Compton Street, Eastbourne, East Sussex BN21 4BW (01323 412000). £20/£18. [R] 8:00 – 10:30 pm, The Ronnie Smith Big Band at The Humming Bird Restaurant, Main Terminal Building, Shoreham Airport, West Sussex BN43 5FF (01273 452300). Free entry with collection. 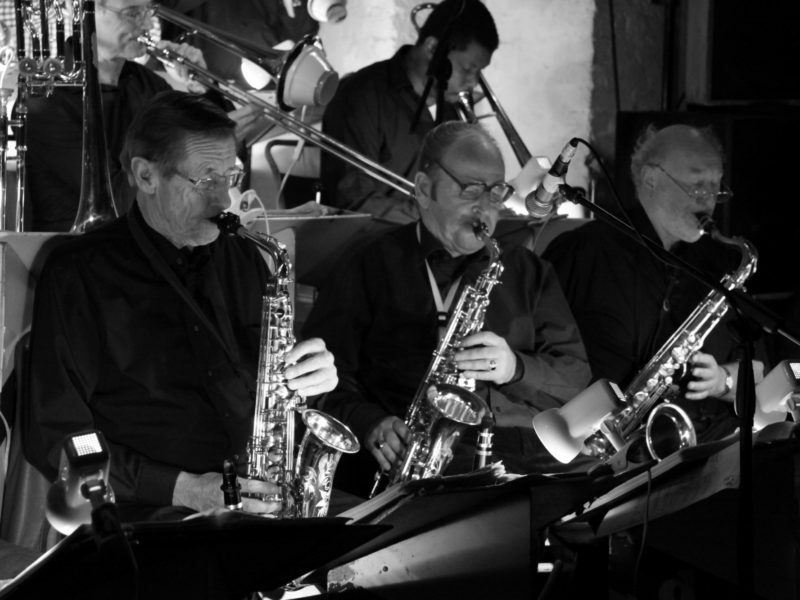 7:30 – 10:30 pm, Big Band @Brunswick: The Mark Travers Project at The Brunswick, 3, Holland Road, Hove BN3 1JF (01273 733984). Free entry with collection. Next month: Another band profile, and more news about big bands based in, or appearing in Sussex. If you would like your band featured, and I have not already contacted you, please get in touch. Anything else, such as gig news, or feedback on this column, that you would like me to include in October’s Big Band Scene, please send it to me by Sunday September 23rd. My email address is g8aac@yahoo.co.uk.